The Metropolitan Police has started an investigation into alleged comments by referee Mark Clattenburg towards Chelsea players during Manchester United's 3-2 win on Sunday. A launched after a complaint by Chelsea, will continue. 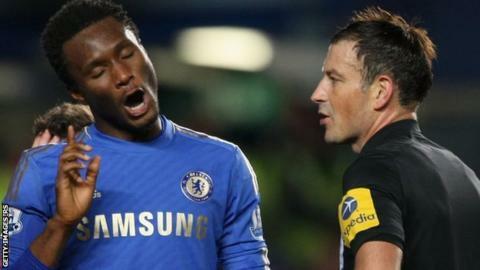 Chelsea accused Clattenburg of using "inappropriate language" including racial words towards two players. Neither Chelsea nor the FA made the police complaint. Peter Herbert, the lawyer behind the potential black players' breakaway union, earlier revealed he made a written complaint to the Metropolitan Police Service (MPS). The Press Association reports that Clattenburg will formally deny the allegations. "The MPS has not received any complaint from either Chelsea Football Club or the Football Association," read a Metropolitan Police statement. "We continue to work in partnership with Chelsea and the Football Association in order to consider any allegation that is made in relation to the reported events." Professional Footballers' Association chief executive Gordon Taylor welcomed the FA's refusal to halt its own investigation following the police announcement. "That is music to my ears, the news I wanted to hear," said Taylor. "We have the ability to deal with these issues rather than the elongation of a process which is no good to anyone." Chelsea finished the match at Stamford Bridge with nine men after Branislav Ivanovic and Fernando Torres were sent off in the space of five minutes, with the latter's second yellow card for diving disputed by Chelsea boss Roberto Di Matteo. Durham-based Clattenburg has not been picked to officiate at a match this weekend. The 37-year-old is viewed by the Professional Game Match Officials, the referees' organisation, as one of the leading officials in the country. He regularly referees games in European competitions and was put in charge of the League Cup final in February and the Olympic final between Brazil and Mexico in August.